The question of where Mandela would be laid to rest was finally resolved in June, months before he passed away on December 5, 2013. The matter was determined by a court order indicating the exhumation and internment of the bodies of Mandela’s three children that predeceased him. According to tradition and Mandela’s wishes, he will be buried with his children. 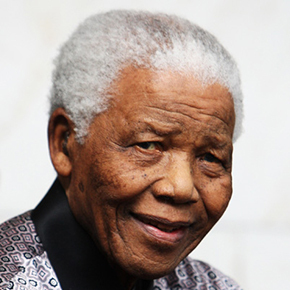 Initially buried at the family home in Qunu, Mandela’s rural home to which the children’s bones have since returned, they were first removed in the dead of night by Mandela’s grandson and self-styled inheritor of Mandela’s ”chieftaincy,” Mandla Mandela. He reburied them at his homestead in Mveso. Some have suggested that Mandla merely wished to protect his grandfather’s bones from any persons with ill intentions and the aim of using them for magical purposes; others argued, more cynically, that family members on both sides envisioned a lucrative tourist attraction at the future site of Mandela’s grave. While his descendants battled over his future bones and for months afterward, Nelson Mandela himself lay in a state of suspended animation in hospital, likely comatose and on life-support. Now, that he has passed away, a sense of uneasiness remains as to where and how the memory of “Tata,” the Father of the Nation, will rest, and what that will mean to future generations. The living death of Mandela’s last months mirrored Mandela’s stillborn legacy that preceded the literal collapse of his health and subsequent expiration by twenty years. Mandela’s post-presidency saw the rise of a larger-than-life caricature of Mandela, one that somehow managed to be smaller than both the real accomplishments of the man as revolutionary and politician, and an apolitical, often commercial, valorization of the failures of a lengthy transition to democracy that never seems to amount to liberation. Readers in the United States will be familiar with the phenomenon of a great hero of human rights and the struggle against racial segregation and apartheid becoming a potent symbol of right-wing spokesmen for what anthropologists have termed “color-blind racism.” Martin Luther King Day, despite being contested as a federal holiday as late as 2000, and which is still celebrated as a Martin Luther King Day/Confederate Heroes’ Day in Texas, becomes an annual opportunity for conservative pundits to rail against positive discrimination and affirmative action using King’s “content of their character” line from the “I Have a Dream” speech, a line that has become ubiquitous. Less remembered is that King was martyred while supporting striking garbage men in Memphis, his declaration that the United States is the “greatest purveyor of violence” in the world today, his opposition to the Vietnam War, or his unfulfilled dream to have millions in his Poor People’s Campaign occupy the nations’ capital. Undoubtedly, King would have objected to these uses and abuses of his legacy, and were he living, would have drawn attention to the continued asymmetrical antagonisms of American life, from drone warfare to increasingly radicalized disparities in wealth, housing discrimination, and massive increases in income inequality. Instead, the misuses of King’s legacy, serve as distraction from and excuse for all that was left unaccomplished after his death. Tragically, it must be said of Nelson Mandela, that he willingly played a similar symbolic role in South African—and global—politics while he was still alive, and perhaps, even that he cultivated an image that could function this way. Mandela is universally loved in a nation, and a planet, still deeply divided by racism. Like the Texas MLK/Confederate Heroes’ Day, Mandela is celebrated in two mutually irreconcilable ways. On the one hand, for the majority of poor racially marginalized South Africans, Mandela is remembered as a freedom fighter, who founded Umkhonto we Sizwe, the armed wing of the African National Congress (ANC) and who sacrificed 27 years of his life to a prison term on Robben Island. He is lionized as the man who individually symbolized the possibilities of national liberation as he walked out of the prison gates and into his one term as the first democratically elected president of a new Rainbow Nation. But to many South African whites and the global elite, Nelson Mandela is an empty symbol of an even emptier politics of racial harmony—and in order to maintain this construction of Mandela’s meaning, the facts of his life are frequently twisted. Though one of many who sacrificed much in a struggle defined by the notion of Ubuntu (collective humanity), Mandela’s story has been primarily told through an individualist lens. His rise from boyish cowherd in the Transkei to towering global figure has morphed into a tale with more ready-made appeal for motivational speakers than utility for future generations of freedom fighters. This happened, not least, because this is the way Mandela himself articulated his own journey in his autobiography Long Walk To Freedom, but the distortion has taken on a life of its own. With Mandela listed on a terrorist watch list drawn up by the USA government as late as 2008, the centrality of political violence to the Mandela story has been so whitewashed and forgotten that after Mandela died, Israeli Prime Minister Benjamin Netanyahu, called Mandela “a man of vision, a fighter for freedom who rejected violence,” grandiosely ignoring the obvious parallels between South African apartheid and the occupation of Israel/Palestine. Both Mandela’s historical role in the South African transition to democracy and his own management of his legacy paved the way for such vacuous treatments of his life. Despite the Hallmark hollowing of his nearly three decades in prison, and constant affirmations of the greatness of his personal character, it is neither his sacrifice nor his rhetorical skill nor his political acumen for which he has been most remembered. If it were, Zimbabwe’s aged and seemingly eternal President Robert Mugabe, who also did his time as a political prisoner, and wowed international audiences in the early eighties, might be equally still considered a global icon rather than an international pariah. Instead, the significant aspect of his legacy is Mandela’s role as the Great Negotiator and the living symbol of Reconciliation. He is a symbol of unity in a country where unity remains almost entirely elusive. His death will change little about this symbolic role, except to perhaps heighten the possibilities for fabrication in the service of perfecting Mandela as a symbol that is most serviceable to the ruling elite. The canonical image of peace-loving, nationally unifying Mandela is, for the historically-minded, the moment when he accepted a Nobel Peace prize with apartheid executive F.W. DeKlerk; for Hollywood, it’s the moment where Mandela donned a Springbok Jersey and reached out to the mostly rabidly racist white fans of the nation’s rugby team, memorialized in Invictus. But the greatness of such moments of reconciliation remains contested for a sizeable number of Mandela’s own struggle-generation comrades from the anti-apartheid movement as well as for many of the younger Born Free Generation that remain economically excluded and socially marginal. His critical ex-wife Winnie Mandela has, since his death, identified the Peace Prize as an unforgivable betrayal. In popular representations of this historic compromise, it too often goes unstated that Mandela’s only bargaining chip was the social and economic power of a massive people’s movement born of strikes in Durban in 1973, the student uprising three years later, and the rise of Steve Biko’s Black Consciousness Movement. Or that the negotiations themselves were a secret affair, hidden, it’s been recently revealed even from even the top leadership of the ANC and Umkhonto We Sizwe. The deal he negotiated on behalf of many others who suffered and sacrificed was essentially this: in exchange for one-person-one-vote, both the accumulated wealth of South Africa’s apartheid rulers and global investors would remain untouched, as would rules and conditions of future accumulation. No redistribution, no land reform, and in place of an overhaul of the capitalist system, the ANC government, in coalition with the South African Communist Party (SACP) (an organization that has retrospectively claimed Mandela as a member) and the Congress of South African Trade Unions (COSATU) would seek, to establish a “national democratic revolution.” All of this was decided before a single South African set foot in a voting booth in 1994. Subsequent battles over housing, health, and economic policy under Presidents Thabo Mbeki and Jacob Zuma have been shaped and fundamentally limited by the terms of this agreement. But this pact—and its symbolic hegemony—in the form of the ascendance of Hollywood’s image of Nelson-Mandela-as-Morgan-Freeman—has recently hit a few bumps in the road. As Mandela faded from public view in August 2012, the national police embarked on the premeditated slaughter of 34 striking miners at Marikana. In the intervening year, with Mandela on life-support and vultures descending to pick over his bones, the murder of Marikana, Cyril Rampahosa has completed an upward trajectory from struggle-era leader of the National Union of Mineworkers (NUM), to board member at mining giant Lonmin, and now to Deputy President of the ANC. The consequences of Mandela’s negotiated transition have been laid bare as a pile of bodies at the foot of a small hill, with literal bullets in their backs. The shakeout of this epochal moment in South African history remains unclear. NUM, the central support beam of COSATU, itself the popular base of the ruling alliance, has been deposed as the industrial representative of South Africa’s miners, who in the years since the end of apartheid have moved from the much-hated prison-like hostels of the mining camps to living in informal, dangerous, and degraded shack settlements around the mines. It seems likely that the first political party with a viable chance of challenging tripartite rule has emerged, led by the erstwhile leader of the ANC Youth League Julius Malema. Malema’s Economic Freedom Fighters (EFF) enjoys widespread youth appeal is rooted in a call to finally “nationalize” the mines. Malema’s wit, humor, and political facility recall the charisma of youthful black-and-white-news-reel Mandela, whose knowing smile and bold rhetoric inspired a generation. 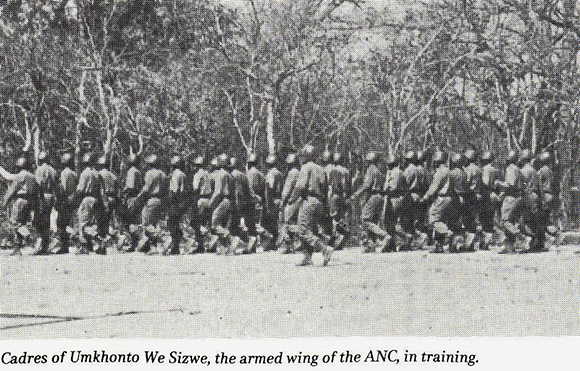 In those days, young freedom-fighters were aiming not merely for the vote and an end to the formal vestiges of colonialism on the African continent, but envisioned a South African nation that could be “for all who live in it,” a goal enshrined in the political and economic rights enumerated in the Freedom Charter, yet which remains unfulfilled. Today’s youth, still desperate, may settle for something less in the name of hope. 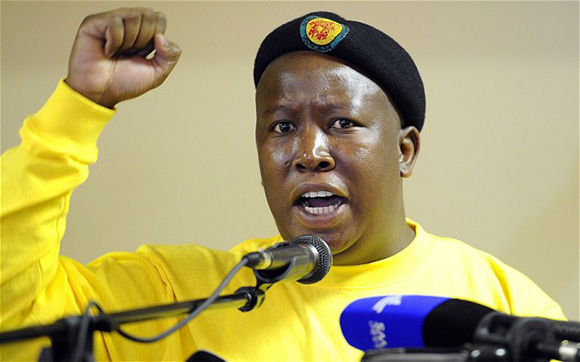 True to the old dictum about tragedy and farce, and despite his enunciated allegiance to the legacy of monk-like Thomas Sankara, Malema is perhaps the real inheritor of the tensions of Mandela’s legacy. Rather than dress up the contradictions as a matter of complex and heroic personal evolution, Malema’s inconsistencies are simultaneous and transparent for all to see. His allegiance to personal wealth and his commitment to the fundamentals of capitalist accumulation are accessories he wears on his sleeve while calling for economic democracy. They are accessories which do not seem to detract from—and likely enhance—his populist appeal to a young generation embittered by economic exile, who yet aspire to the consumer trappings of “success.” To them, perhaps, such open hypocrisy seems one step further on the “long walk” to freedom in a political landscape where the new non-racialism seems much like the old racism, and where symbols have long substituted for substantive change. Kate Doyle Griffiths-Dingani is a Ph.D. candidate in Anthropology at the CUNY Graduate Center and a member of Solidarity. This piece was originally published on New Politics.